David W. Andrews, Ph. 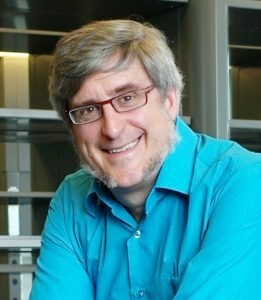 D.
Dr. David Andrews is director of and senior scientist in Biological Sciences at Sunnybrook Research Institute (SRI), Professor of Biochemistry and Medical Biophysics at University of Toronto and a Tier 1 Canada Research Chair. His research comprises, the molecular mechanisms by which Bcl-2 family proteins regulate apoptosis, the assembly of proteins into membranes, high-content screening and development of new microscopes for fluorescence lifetime imaging microscopy (FLIM) and hyperspectral imaging. Dr. Andrews uses fluorescence spectroscopy and automated fluorescence microscopy to study interactions between proteins in membranes, protein localization in cells and the effects of drugs on cells. He has established a facility for image-based high-content cellular analysis at SRI that includes instrumentation for automated imaging and analysis of cells in monolayer and 3D cultures. His lab has discovered and characterized small molecules that have application to cancer and regenerative medicine. Dr. Andrews is active in the private sector where he has participated in the start-up of two companies, consults for several other companies and performs contract research for a variety of biotech companies. He holds licensed patents in areas such as translational regulation, in vitro evolution and peptide display technologies. 1996-1998 Board of Directors, MBI Fermentas Inc.
2000-2002 Scientific Advisory Board, Isogenica Inc.